Lake Ladoga is the largest lake in the Europe covering a total surface area of 6,700 square miles. It is located in Northwest Russia. The average width is 83 kilometers and the north to south length is 219 kilometers. It is the world’s 14th largest freshwater lake on the basis of area. The Karelian Isthmus separates Lake Ladoga from the Baltic Sea. Then, it drains into the Gulf of Finland via the Neva River. The basin area of the lake includes 50,000 smaller lakes and more than 3,000 rivers. This lake’s water is yellow-brown in color because of an aqueous compound, calcium hydrocarbonate. The climate in this region is moderately cold. The average annual precipitation is 24 inches. The cities located on its shores include Priozyorsk, Shlisselburg, and Sortavala. Levels in the lake remain highest in June and July and lowest in December and January. The average annual elevation of Lake Ladoga is approximately 2.6 feet. The lake consists of around 660 islands that cover a total area of about 435 kilometers. The shores of the lake are low and marshy in the South and indented in the North. This lake is rich with fish. Approximately 48 different species of fish have been encountered. It gets eighty five percent of its water from its tributaries. Declan, Tobin. " Facts for Kids about Lake Ladoga ." Easy Science for Kids, Apr 2019. Web. 21 Apr 2019. 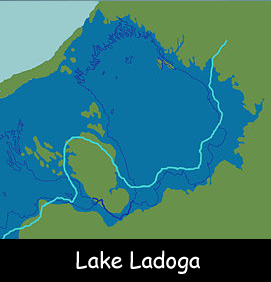 < https://easyscienceforkids.com/lake-ladoga/ >.